Entry doors with sidelights can increase your home's curb appeal and allow additional natural light into your home. There are many different options for this type of window. Colored and beveled glass can create beautiful colored light in your entryway, while unusual window shapes and sizes can be designed to match the architectural history of your home. Since the range of options for entry doors with sidelights is large, their range of costs can vary as well. Glass side panels can be expanded to include elaborate custom-designed stained or leaded glass pieces. Because of the intricacy of this type of window, homeowners should do their research before investing in entry doors with sidelights. Read on to learn more about the prices for entry doors with sidelights. Entry doors with sidelights usually include a wide variety of glass or faux-glass inserts to create an elegant entrance to the home. The prices of sidelights can range from as low as $1,000 to as high as $10,000, depending on the complexity of the glass and other materials. In addition, homeowners should keep in mind that installation and labor fees generally add between $100 and $200, depending on your contractors. 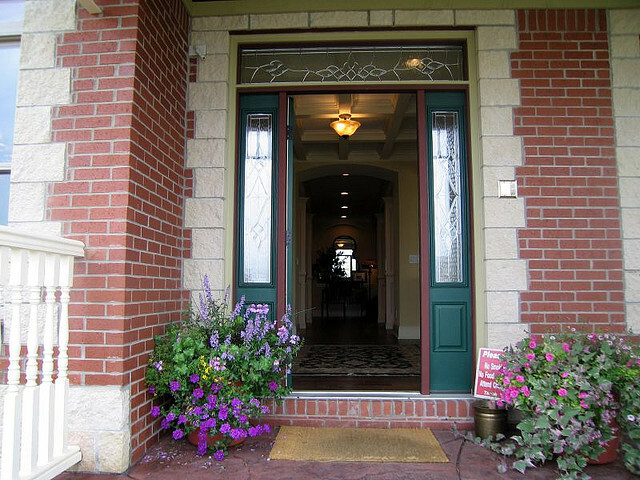 Entry doors with sidelights are generally available in leaded glass, clear glass, obscure glass, or tempered glass. The addition of tempered insulated glass also adds an extra level of protection against cracking and air loss. These tempered panes are typically utilized in heavy patio doors and windows to create an impact-resistant surface. Leaded glass, on the other hand, can add geometric patterns and contrast to an entry door with sidelights. Similarly, beveled glass resembles stained glass and consists of thick piece of glass, angled to create large prisms of refraction and color. Stained glass, however, adds an extra level of customized elegance. Stained glass consists of various pieces of colored glass in basic material to create a truly one-of-a-kind effect. Finally, as far as maintenance and insulation goes for entry doors with sidelights, fiberglass is by far the most superior material due to the hollow cavity of the fiberglass panel. One lesser-known alternative to entry doors with the traditional fixed sidelights is the addition of operable sidelights. Composed of venting side panels on either side of the door, these sidelights resemble casement windows, and act as a source of ventilation. Whether the sidelights and transoms are operable or fixed, entry doors with sidelights covered in low-e glass provide an energy efficient seal. This high-performance glass can block heat flow with a thin, metallic coating. By reducing heat loss to the outside in the winter and keeping your home cool in the summer, low-e sidelights and transoms are an excellent energy investment. The addition of entry doors with sidelights can increase lighting as well as boost your home's curb appeal. With the wide range of material options and designs, homeowners can certainly find the one in a million entry door that will help their home to stand out from all the rest on the block.